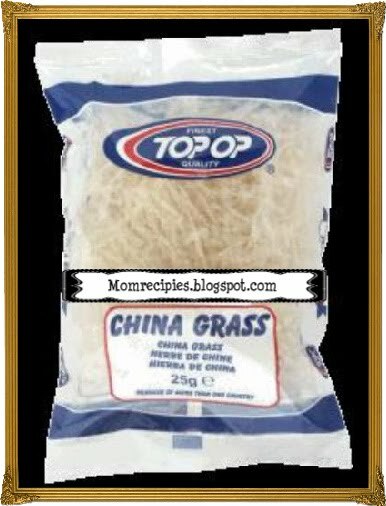 China Grass is also known as Agar Agar / faluda . It is nothing but a Vegetable ‘gelatine’ derived from a various seaweeds which are processed by boiling and drying. It has no aroma and has a neutral taste.Agar-agar is used as a quick-setting base for many sweets and desserts in Asia. It is available in powdered form or as dried strands.While using strands ,always cut the strands into small pieces(with scissors) and soak them in warm water for 10-15 min. * Cut the agar agar strands into small pieces and soak them in warm water for about 15 minutes. * Meanwhile keep the milk for boiling . * Squeeze out agar agar to remove water.Mix this to the boiling milk and keep stirring continuously. * Let it simmer and cook till fully dissolved. * Add sugar and keep on stirring till sugar dissolved completely.This could take between 2-4 minutes. 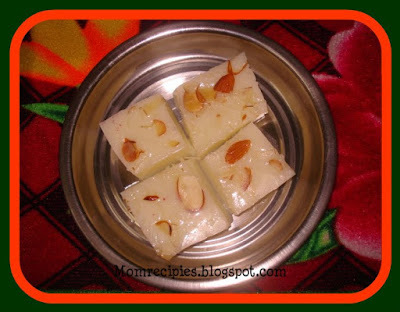 * Grease the Plate and Spread it on plate or in individual molds and sprinkle nuts like almonds, walnuts or raisins ,charoli etc and let it cool at room temperature till it is cold. After setting ,cut it into squares or diamonds.If using a mold, invert the pudding and serve. * Chill it in refrigerator and enjoy it cold or at room temperature. "Squeeze out agar agar to remove water.Mix this to the boiling milk and keep stirring continuously. "here mix what in the boiling milk?agar agar or the water to milk? You have to mix squeezed agar agar to the boiling milk.